BY JOAN CARROLL CRUZ A unique little prayerbook of powerful prayers and devotions, including wonderful promises attached that were made by Our Lord or Our Lady, most of which were revealed to various famous Saints. 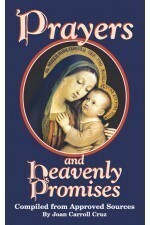 Includes devotions to Our Lady, the Infant Jesus, Precious Blood, Sacred Heart, Divine Mercy, St. Michael, etc. Shows that God wants to grant us favors--if we will just pray!